All these concerts are cycles with a different number of parts, from four to ten, and dramatic inner structure. Every part of every piece is a choral miniature with the dramatic base of the composition usually consisting of two or three intercommunicating lines. This type of construction is similar in all the composer’s concerts and first appeared in his early compositions of 1982-84. In his works Smirnov sets to music Russian poetry from various periods by a wide range of authors, from the poet Nekrasov (mid-nineteenth century) to Nabokov songs, the poems of the well known Russian writer Vladimir Nabokov dating from the middle of the twentieth century. However, the most important works feature poetry from the beginning of the twentieth century, the ‘Silver Age’ of Russian poetry. The composer sets the lyrics of Alexander Blok, Marina Tsvetaeva, Innokenty Annensky, Osip Mandelshtam and Anna Akhmatova, trying to recreate the unique style of each poet. Consequently in the works of Smirnov, the concert for a cappella choir is a kind of mirror, in which the unique features of his musical language and its development are reflected. One of the distinctive features of the composer`s musical language is to bring multidimensionality into choral music as a main attribute. He refuses the traditional organisation of musical space in choral compositions, consisting of two dimensions – horizontal and vertical – to form a new coordinated system with three dimensions – horizontal, vertical and depth. In attaching depth to the musical texture the composer is looking to bring about the simultaneous exploration of remote areas. He is trying to surround the listener with sounds from different points in space and extend their influence. By realising this aim Smirnov created a kind of ‘spatial toolkit’ that consists of three types of technique: reverberant technique, aleatoric technique and stereophonic technique. This technique is based on the effect of a reverberant persistence of the sound, similar to the natural reverberation in the acoustics of a large cathedral or concert hall. This effect is one of the clearest and the most recognisable attributes of the composer`s style. We can spot it even in his early works and then trace it through all his musical periods. The reverberant persistence of the sound may be represented in the reverberant stratification of chords or in reverberant aftersound. Reverberant stratification of chords is a momentary imposition of melodic sounds, or different harmonic complexes which come to form a new polytonal sonority. The consecutive imposition of melodic sounds occasionally creates cluster spots. Reverberant aftersound is the rapid reflection of single melodic sounds with a high-pitched sound in the upper voices that is similar to natural reverberative high-frequency aftersound. The use of determinate aleatorics in choral music gives the possibility of creating within a strictly ordered texture an area of natural variance. Aleatoric techniques in the works of Smirnov are represented in the serialisation of rhythm and melody united into serial complexes, often used in the last part of choral works and aleatoric layers. Serial complexes had first appeared in the early works (1981-83). They are presented as determined serialised melodic structures with ordered time intervals of entry. The composer frequently uses these structures at the end of the piece as a kind of complex morendo. Aleatoric layers in Smirnov`s choral works can be a classic example of using the determinate aleatoric technique in vocal music, where musical form is determinate but texture is indeterminate. Layers are usually formed from uniform structures as an interval or short motif (4-5 notes). Rhythm, dynamics, articulation and speed are indeterminate. Texture, pitch and timbre are always determined. A flexible texture layer, ‘breathing’ space, creates the background of the whole composition. In this ‘proto-matter’ appear elements of the future theme. 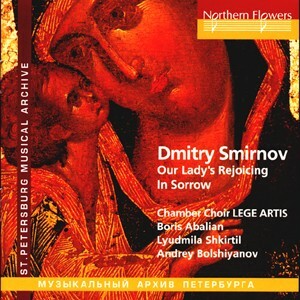 Smirnov frequently uses a stereophonic technique in the sonorities of the double choir or in antiphonal singing by two different parts of the choir. The stereophonic effect may include using a single type of musical material that is performed by two different sound sources, located some distance apart. Continuous development of a single musical phrase with different groups of performers, entering alternately, creates a feeling that a sound source is being spatially changed. 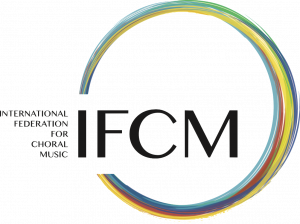 Depth as a characteristic of choral texture is not only a notable feature of the composing style of Smirnov but also heralds a new direction in the development of choral music. At the same time the term ‘depth’ to describe a choral composition has another meaning, distinct from the traditional one which was formed in the context of minimalist compositions at the beginning of the 20th century. The major difference lies in the system of relationships between depth and melody. In the choral music of Smirnov melody is the most important aspect. Lines, outlines and layers can reproduce an amazing polyphony of life that is changing, flowing and has no end. Thus maintaining linearity becomes an obligatory condition when working with the depth aspect. The synthesis between depth and melody gives the possibility of enriching both of them. The melody now has spatial form and the depth acquires some dynamics. Adding the depth dimension without losing the connection with the sounds in the melody is the main compositional feature of Smirnov`s method. Spatial melody with inner counterwork of the voices. In the early works of the composer melody has a traditional monophonic structure, but in the first concerts of the mid-1980s a new type of melody is starting to appear – monorhythmic chordal melody. Monorhythmiс chordal melody is a melody enlarged to the size of a textural layer; a movement of chords that repeats a melodic line and gives it spatial form. Spatial melody is a polyphonic, main layer of the texture, organised linearly and consisting of strictly ordered thematic material and derived musical structures that share an intonational identity with the thematic material. This type of melody appeared first in the works of the late 1980s. 3. Spatial melody with inner counterwork of the voices. Spatial melody with inner counterwork of the voices is the most complicated type of choral texture. In this textural layer subsidiary melodies are extremely well developed, rhythmically and melodically. As a result they start to compete with the thematic material and seem to be trying to destroy its wholeness. Smirnov is unique among modern Russian choral composers. Research into his choral works offers the chance to understand the depth and beauty of his musical language and to observe the development of modern Russian choral art. Dmitry Smirnov was born in 1952 in Leningrad. He graduated from the Leningrad Conservatory in 1975 in Choral Conducting, studying with A.V. Mikhailov and in 1978 in Opera and Symphony Conducting studying under Edouard Grikurov. He completed his postgraduate course in 1980. At the same time he started work at the faculty of choral conducting at the Rimsky-Korsakov College of Music in St Petersburg and then at the Conservatory. For more than 15 years Smirnov was chief conductor of the Women’s Choir of the St Petersburg Musical College named after Nikolai Rimsky-Korsakov. In 1987 he became a member of St Petersburg Composers Union. Smirnov was recommended to join the Union by the celebrated composers Valery Gavrilin, Sergei Banevich and Alexander Knajfel. Since the 1980s Smirnov’s choral compositions have become part of the concert repertoire of many choirs in Russia and abroad. His music is popular and well known among famous choirs such as the Lege Artis Chamber Choir (conducted by Boris Abalyan), the St Petersburg Chamber Choir (conducted by Nikolai Kornev), the St Petersburg State Conservatory Choir (conducted by Valery Uspensky), St Petersburg State Capella Choir (conducted by Vladislav Chernushenko), the Moscow State Conservatory Choir, the Women’s Choir of Rimsky-Korsakov College of Music in St Petersburg (conducted by Sergei Ekimov), and the St Petersburg Radio Children’s Choir (conducted by Stanislav Gribkov). Choirs from Spain, England, Sweden Hungary, Germany and the Czech Republic also perform his music. Smirnov is not only a choral composer. He has also written music for drama performances and films, instrumental and vocal music. In 1985-87 he wrote an opera based on Yerma, the drama by Federico García Lorca. In 1990, together with another composer Sergei Banevich, he wrote the chamber opera “The Little Match Girl” which won a First Prize at the International Competition of Children’s Opera and was staged in the Polish city of Lodz in 1993. In the same year he won a Composition Competition in Tolosa, Spain, with two choral works: Avaiur and Lo Harc ainguria. During the 1990s the composer approached sacred music of different times and religions. In 1993 he wrote Prayers on the text of the Russian Orthodox Liturgy and Vespers and in 1998 he composed a concert for female choir, Tebe poem (Laudamus Te). At the beginning of the 2000s he created two major compositions, Litaniae Lauretanae and Doleful Blisses of the Virgin. They are both inspired by the image of the Holy Virgin Mary. Litaniae Lauretanae was written in 2000 on the text of a Catholic prayer to the Virgin first recorded in the monastery of Loreto, Italy. This is a work for mixed a cappella choir and countertenor. The choral fresco Doleful Blisses of the Virgin was created in 2001. This monumental composition is based on the text of apocryphal Russian Christian poems which are part of Russian spiritual folklore. Frescos was written for solo female voice, soprano saxophone and mixed choir. During the entire performance voice and saxophone are speaking in dialogue and the choir sings in a style similar to Strochnoi singing, the line hymnody in the Medieval Russian Orthodox Church.